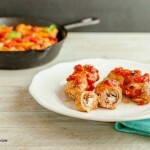 Italian Pork Rollatini Low Carb. Savory stuffed rolls of pork that are grain free and low carb. 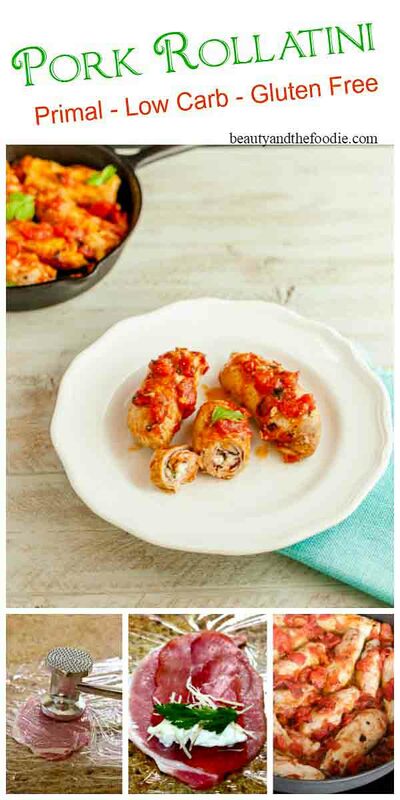 Italian Pork Rollatini Low Carb is a grain free, gluten free, flavorful Italian way to serve pork or chicken. 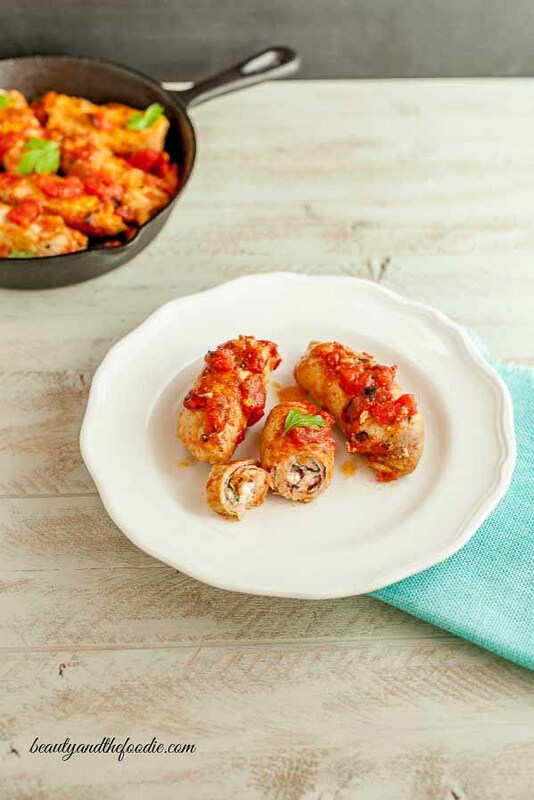 Flattened pork cutlets stuffed with prosciutto, ricotta cheese, parmesan and parsley, then simmered in a tomato sauce. 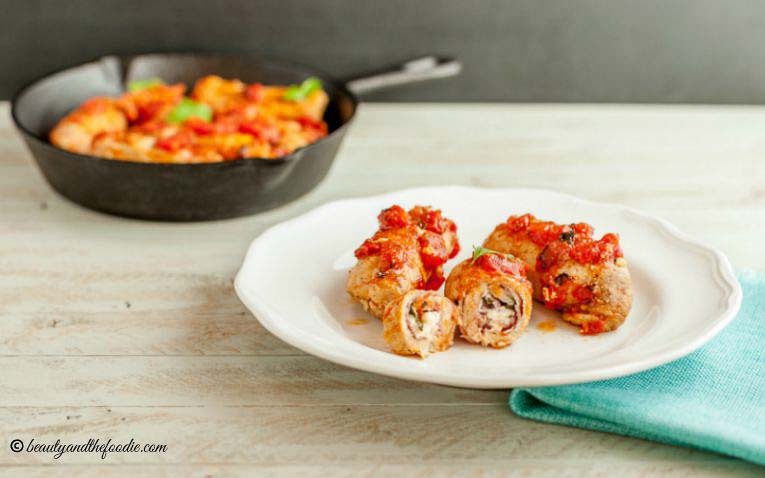 Savory rolls of pork stuffed with Italian goodness. My Hubby and kids absolutely loved these. 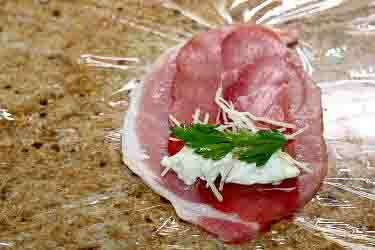 Flatten Pork Cutlets with Mallet. Top with prosciutto, ricotta, parsley & Parmesan. Roll pork and close rolls with a toothpick. Pan sear and then simmer pork rolls in sauce. 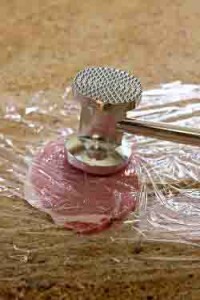 Place a pork cutlet between 2 sheets of plastic wrap and flatten pork cutlet with a kitchen mallet or pounder until very thin (about ¼ inch). 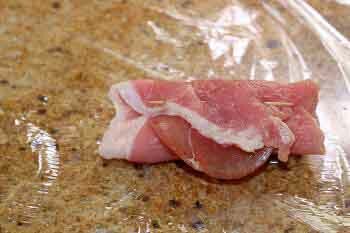 Peel back top of plastic wrap and place a slice of prosciutto on the flattened pork. Place about a tbsp of ricotta on top and sprinkle with a little parsley and parmesan. Roll pork cutlet up around filling, and use a toothpick to close. Pinch the side ends closed (the side ends should stick together). Repeat with other cutlets. In a large fry pan over medium high heat add the olive oil and place pork rolls toothpick side down in pan. Fry until just browned and turn to brown other side. Remove pork rolls from pan, set on a plate, and let cool. Remove toothpicks from pork rolls and set aside (they will return to the pan later). In the same fry pan add onions and minced garlic. Saute over medium heat until onions are translucent. Add chicken broth to the fry pan and loosen garlic and onions from pan and stir together. 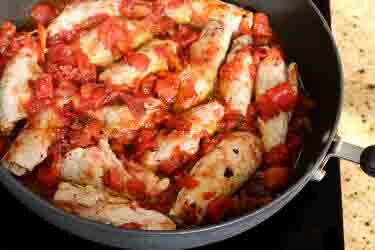 Add pork rolls back to the frying pan and cover with the diced tomatoes and liquid. Sprinkle with sea salt and Italian seasonings. Heat to a boil, then turn heat to low, cover and simmer for 30 minutes. Sprinkle with optional extra Parmesan & Serve. Nutritional Data: Servings: 6, Serving size: 1 roll, Cal: 280, Carbs: 3 g, Net Carbs: 2 g, Fiber: 1 g, Protein: 34 g, Fat: 17 g, Sugars: 1 g.
Heat to a boil, then turn heat to low, cover and simmer for 30 minutes. Serve.